A salad of local greens from Serendipity Farms, sliced almonds, crispy leeks and your choice of house vinaigrette or creamy Mayfair dressing. A plate of ahi wonton nachos: cured ahi tuna, garlic aioli and Worcestershire teriyaki glaze on top of a fried wonton skin. Cheese and spinach stuffed ravioli served over a bed of spinach and topped with lobster, artichoke, tomato and basil cream sauce. A chocolate chip cookie baked into a brownie topped with warm butter pecan sauce and vanilla ice cream. Wondering where you can taste these delicious salads, appetizers, entrees and desserts? Wichita Restaurant Week will serve up these dishes and many more from January 22-31, when 25 area restaurants will offer special menus designed to give visitors and locals a chance to discover why Wichita was called a "Top 10 foodie city" by Livability.com. This 10-day event is a great time to try a restaurant new to you, support one of your favorite chefs, get a great deal at some of the city&apos;s best eateries or have an excuse for dining out: 10 percent of all proceeds from the Wichita Restaurant Week menus will be donated to the Boys & Girls Clubs of South Central Kansas. 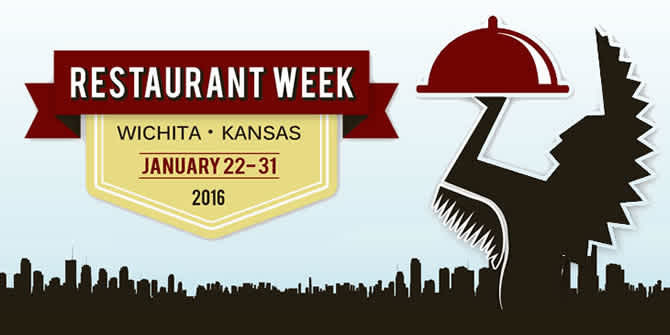 The 2016 event is the third installment of Wichita Restaurant Week, coordinated by Visit Wichita and the Kansas Restaurant & Hospitality Association. New this year is a focus on giving guests a true dining experience: Each restaurant will serve three courses of a salad or appetizer, an entrée and a dessert. Many of us don&apos;t always splurge the time or money on three courses. Consider these 10 days your justification to slow down and experience all a restaurant has to offer. The restaurants are making it easy with pre-set menus, which you can view at wichitarestaurantweek.com or by clicking a specific restaurant link below, although in most cases you&apos;ll have choices to make. For example, at Harvest Kitchen at downtown&apos;s Hyatt Hotel, you can dine at lunch or dinner. At lunch, you&apos;ll pay $15 per person for a plate of pork sliders marinated in Knob Creek Whiskey, fries and your choice of dessert. For dinner, you can choose any entrée at menu price and receive a complimentary house salad and dessert. Prices vary as much as the menus. For instance, Wine Dive is offering an Italian Tasting Menu featuring either fish or beef set at $35 per person while Delano Barbeque Co. is offering dinner for two for $35. Organizers have recruited a diverse mix of restaurants to offer a variety of cuisine and price points for every budget. Of the 25 restaurants, 12 are participating for the first time. Click on the links below to learn more about each, including their menus and pricing for Wichita Restaurant Week. Each participating restaurant has generously agreed to donate 10 percent of all orders from their Wichita Restaurant Week menus to the Boys and Girls Clubs of South Central Kansas. Since 1990, the Boys & Girls Clubs of South Central Kansas has provided young people with one-on-one relationships with caring adult professionals and fun, age-appropriate programming to nurture kids&apos; self-esteem. If someone in your party wants to order an item not included on the Wichita Restaurant Week menu, you can still support the Boys and Girls Clubs. Ask your server for an Extra Helping envelope. You can enclose a donation that will go directly to the charity, or you can also visit BeGreatWichita.com to make your donation online. This year&apos;s event spans two weekends so you&apos;ll have plenty of time to try as many of the 25 restaurants as you&apos;d like, but be sure to plan ahead. Some establishments require reservations during Wichita Restaurant Week; you can see reservation and menu details at the links above. When you dine Jan. 22-31 and order from the Wichita Restaurant Week menu, be sure to take selfies or photos of your food. Post them on the event&apos;s Twitter or Facebook accounts with hashtags #ICTdining and #WRW16 for a chance to win $50 gift certificates. To hear more about Wichita Restaurant Week, watch this video for conversations with several of the participating restaurateurs.